Mud River welcomes Dr. B! a healthy immune response, the majority of these cases will resolve without treatment. Parasites are like pirates . . . they will commandeer your pet like pirates take over a ship. You cannot always see parasites but that doesn’t mean they do not exist! A keen sense of sight is a necessary attribute in sporting dogs. Eye injuries can occur during outdoor training and hunting activities, and dogs with pre-existing eye defects or deformations may be more susceptible. Certain facial anatomy in different breeds of dogs can also contribute or make some dogs more susceptible to injury. Summer heat and strenuous exercise can be a deadly combination for sporting dogs, regardless of their overall health and weight status. Dogs cannot sweat other then through the foot pads, so their ability to regulate body temperature in warm environments is difficult. Mud River is proud to announce that they have partnered with Dr. B to share veterinary tips on social media. Be sure to follow Mud River on social media to hear the latest tips from Dr. B.
Amanda Burow, D.V.M. (Dr. B), is a graduate of Iowa State University’s College of Veterinary Medicine. Dr. Burow’s patient list includes hunting dogs of all varieties, as well as several field trial dogs and full time sporting guide dogs. 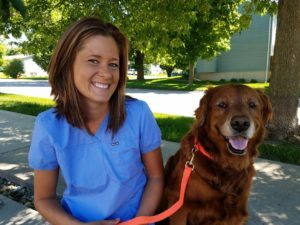 In addition to practicing general veterinary medicine, she has special interest in the areas of preventive care, emergency medicine, and dermatology. In her spare time, she enjoys being outdoors and on the lake, staying active, reading, and spending time with family and friends. Mud River is proud to announce that their short film “November Winds”, produced by Safari Classics Productions has won a prestigious Silver Telly award, the organization’s highest honor. The Telly Awards honor the nation’s best film and video productions and only a fraction of the 13,000 entries receive a Silver Telly.